7. Know what to do when a bird hits your window. 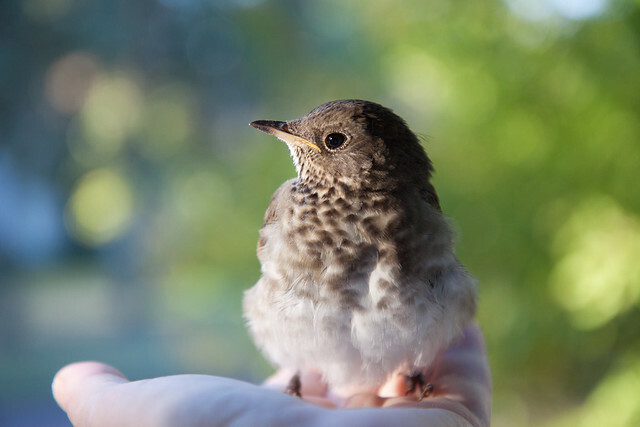 If a bird slams into your window and isn’t moving or is fluttering helplessly, what should you do? Is it best to leave the bird alone or to interfere? If an injured bird is lying on its back, it may go into what seems to be a hypnotic state and simply be unable to balance or right itself. If you don’t help, it may die unnecessarily. But how do you help? First, protect yourself. Most songbirds, even chickadees, can pack a wallop with their beaks but are usually harmless while in a dazed state. However, the talons on even a semi-conscious hawk can cause serious injuries. Wear thick leather gloves to handle hawks or owls. Never put any wild bird into a cage. Its feathers may become frayed against the metal bars, compromising its ability to fly. 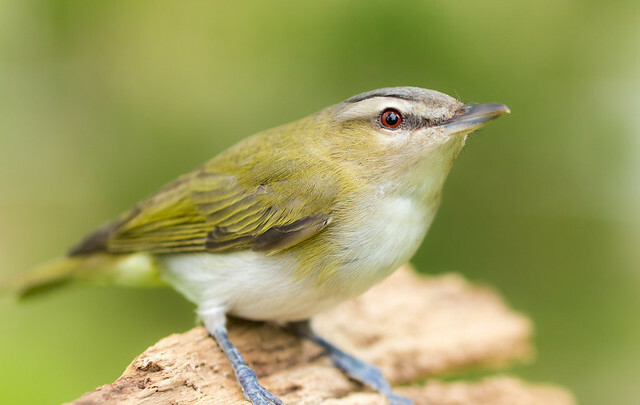 The best way to help a bird after a window strike it to gently place it right side up on a branch in a dense shrub to see if it can perch properly. If it can, it has a chance of recovering on its own. 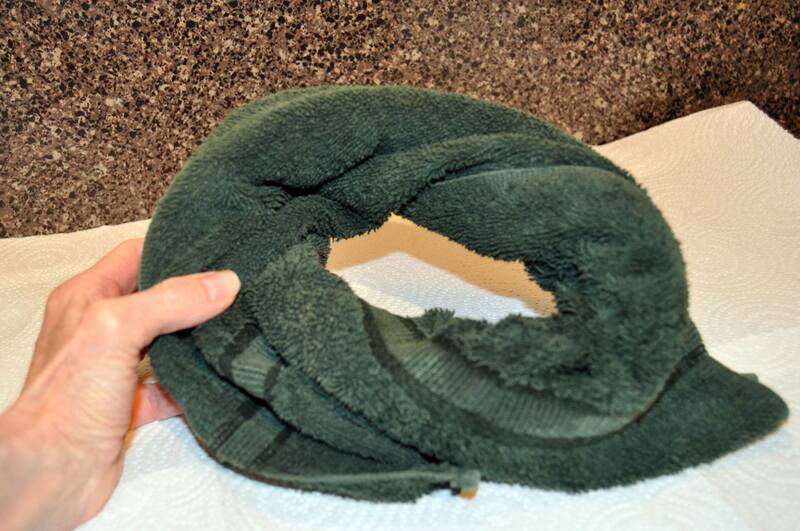 If it can’t, put it in a small cardboard box, propped if necessary in a “donut cushion” fashioned out of tissue. For most backyard birds, a shoebox is perfect. Close the box and place it in a quiet place. Every ten or fifteen minutes, take the box outdoors, open it, and see if the bird flies off. Never open the box indoors. And don’t release a songbird after dusk—wait until morning. If the bird is ready to leave, it will usually be able to take off from the box. If not, hold it in your hand as you try to release it, but don’t toss it in the air to “launch” it. Just open your hand and be patient—you can gently touch its tail to see if that speeds up the process. Most birds with minor concussions recover within an hour or two if they’re going to recover at all. If blood or black spinal fluid is coming from the mouth, the bird is most likely fatally injured. Otherwise, there is at least a chance that it will recover. 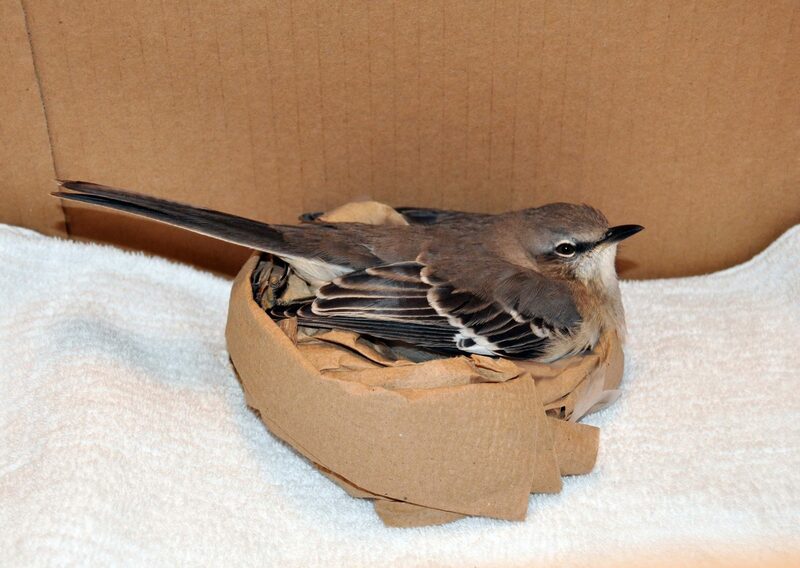 If the bird doesn’t fly away soon, get it to a wildlife rehabilitation facility as soon as possible, transporting it in a cardboard box or a large paper sack.